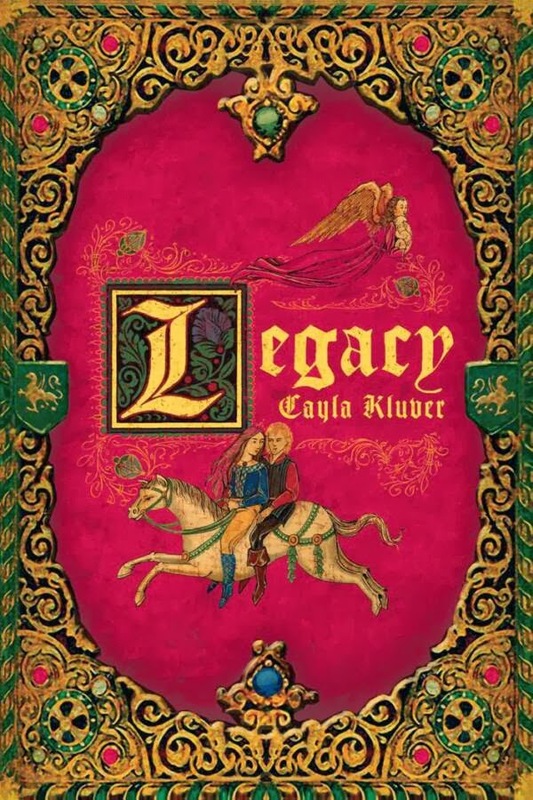 The Debut book of author Cayla Kluver, Legacy is a richly drawn medieval fantasy, which you will like if you enjoyed books such as Poison Study by Maria V Snyder, or Graceling by Kristin Cashore. In her seventeenth year, Princess Alera of Hytanica faces one duty: to marry the man who will be king. But her father's choice of suitor fills her with despair. When the palace guard captures an intruder -- a boy her age with steel-blue eyes, hailing from her kingdom's greatest enemy -- Alera is alarmed…and intrigued. But she could not have guessed that their clandestine meetings would unveil the dark legacy shadowing both their lands. In this mystical world of court conspiracies and blood magic, loyalties will be tested. Courage won't be enough. And as the battle begins for everything Alera holds dear, love may be the downfall of a kingdom. The first thing that struck me about Legacy was the great cover (pictured above). I absolutely love it, and think that it does justice to the mood of the book. The introduction also intrigued me as to what was going to happen, with a strong opening sequence and mood that is inviting, and compelling. This review will take a different course than that of my average review, as I believe it to be necessary. I have read many reviews of Legacy, many positive, but also many which raise a few aspects of the novel that were commonly seen as disagreeable. I generally found that these aspects (protagonist, pace, plot [accidental alliteration!]) were what I loved about it so much, and this has not changed after finishing it, neither has it altered upon reflection. The plot of Legacy was definitely something that struck me as different to many novels, as the action seems to be more of a backdrop for a social dissection of sorts, rather than the 'main event'. I must stress that this doesn't mean that the story was uneventful, much the opposite in fact. Due to the first person point of view however, there was much analysis of characters' actions and motivations, as well as a general commentary on the action taking place. For me it seemed that Kluver had created a world, let the characters play, and then stepped back and given a commentary of what was happening from the point of view of someone who holds the beliefs, values, and attitudes (although sometimes different to the dominant) of the society which had been created. I MUST address the protagonist, Princess Alera of Hytanica, the narrator of this novel. While I have read many reviews in which people were frustrated by her recurrent lack of inaction, and seeming weakness, I have to disagree for the most part. I loved the character Alera, and found her a very agreeable protagonist who I did come to love. On the other hand, I was sometimes irked by Alera's lack of action. However, it is worthy to note, that upon the assumption that this is a medieval fantasy [which I did get the impression it was], and considering the social structure of the patriarchal Hytanica, in this situation, women did not really have an active role in decision making - especially in politics. This is hard to comprehend from my point of view, given the modern franchises that I possesses, but nevertheless, I did not find that this tainted the novel in any way for me, as I found it true to itself. The pace of the novel is reflected in the size of the novel. Being a 496 page paperback novel, Legacy was definitely a large read. The main 'action' itself could have filled a novel half the size, but it was the little, ritual things that the reader has insight into, that makes it a slower pace. It has the same amount of action as any other novel, but it was the space in between that was full of commentary from Alera's part that made it more spaced out. Also, the action did not move as fast when it happened because of the rich descriptive style of the prose. Personally, I thoroughly enjoyed this aspect of the novel, as I felt that it changed the story from a typical romance/ medieval fantasy story of warring kingdoms to something altogether more enjoyable. At the beginning of this review, I likened Legacy to Graceling, and Poison Study; the likeness being in the female protagonist and narrator, fantasy world, and a similar mood. While Graceling and Poison Study show many similarities in their headstrong protagonists and fantasy plot, I chose to add Legacy to this list because I feel that it portrays the same essence as the other novels. I had the same feeling while reading all three, and I truly believe that if you are a 14+ female, then you would enjoy this novel, as well as the others mentioned. Let me know what you think of the review, the book, and if there are any other books that are similar.